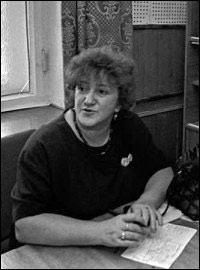 On the evening of 20 November 1998 Galina Starovoitova, a deputy of the second convocation of the State Duma, was killed in the entry hall of the apartment building where she lived in St. Petersburg. She was murdered on the eve of elections to the St. Petersburg legislative assembly. That evening Starovoitova had flown from Moscow to St. Petersburg. At Pulkovo airport she had been met by Ruslan Linkov, and the two went together to the apartment building where Starovoitova lived. At an evening in her honour in the year of her death, ex-deputy of the RSFSR and People’s Artist Oleg Basilashvili said: "She was the only contemporary Russian politician who was not afraid to have her voice heard on the most difficult, serious and dangerous questions, and whose voice was heard. And now we have frozen in some kind of strange silence and premonition of a return to whispered conversations in our kitchens..."
Galina Vasilievna Starovoitova was a Russian politician and statesperson, a specialist in ethnic relations, a human rights defender, and a historian. She was shot dead in St. Petersburg on 20 November 1998 in circumstances that to this day remain unclear. Galina Starovoitova was born on 17 May 1946 in Chelyabinsk. In 1964 she graduated from high school No. 397 in the city’s Kirov district (from 2004 this has been Starovoitova Gymnasium No. 397 – in Soviet times it had been named after the Bolshevik leader Kirov) and entered the Leningrad Military and Mechanical Institute. However, having finished three courses she entered the psychology faculty of the Zhdanov Leningrad State University, from which she graduated with merit in 1971. During 1968–1971 Starovoitova worked as an engineer and sociologist for the Red Dawn telephone production enterprise in Leningrad. In 1972–1973 she worked as a senior engineer and sociologist at the Leningrad Central Scientific Research Institute for shipbuilding. 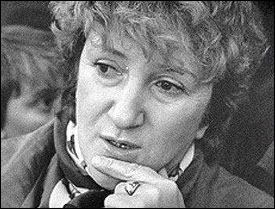 In 1977–1991 she was a researcher and then senior researcher at the Institute of Economics of the Academy of Sciences of the USSR, and senior researcher at the Centre for the Study of Interethnic Relations of the Presidium of the Academy of Sciences of the USSR. At the end of the 1970s and beginning of the 1980s she took part as an ethnic psychologist and leader of the work of international research expeditions studying the phenomenon of longevity in Abkhazia and Nagorno-Karabakh. In 1989 Starovoitova was a candidate in the election of People’s Deputies of the USSR from the Armenian Soviet Socialist Republic. On 14 May 1989 she was elected by an overwhelming majority of voters, winning 75,1% of the votes. 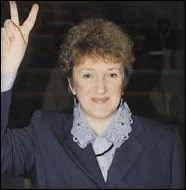 In 1989–1991 Starovoitova was a People’s Deputy of the USSR. In 1990 she became a People’s Deputy of the RSFSR and a member of the Committee of the Supreme Soviet of the RSFSR on human rights. From 20 July 1991 until 4 November 1992 she was an adviser to the President of the RSFSR on inter-ethnic relations. In October 1993 she became head of a centre for the study of the politics of ethnicity at the Institute for Economic Problems of the Transitional Period. In 1995 she stood for election as a deputy to the State Duma from St. Petersburg’s Northern Single-Member Constituency No. 209. Together with Lev Ponomarev and Gleb Yakunin she headed the election bloc 'Democratic Russia – Free Trade Unions'. She won the election and became a deputy of the State Duma. Each time Galina Vasilievna took part in parliamentary elections she did so from a single-member constituency and never as a member of a party list. On 29 January 1996 the Central Election Commission registered an initiative group of voters who put Starovoitova forward as a candidate for the post of President of the Russian Federation, but on 26 April 1996 the Central Election Commission rejected Starovoitova’s candidacy. In January 1996 Starovoitova became a member of the State Duma committee on civil society and religious organizations. On 7 January 1996, at almost 50 years of age, she was christened in the church of Mikhail the Archangel in Troparevo. In April 1998 she became chair of the federal party Democratic Russia and co-chair of the movement Democratic Russia. She headed the electoral bloc Northern Capital in preparation for the elections to the legislative assembly of St. Petersburg in 1998. Over these years, taking part in many international conferences, symposia and discussions, she became widely known and met many of the prominent politicians of various countries, including Margaret Thatcher, Jacques Chirac, Henry Kissinger, Lech Walesa and Vaclav Havel. As a lawmaker, Starovoitova had to deal with constant resistance from the “aggressively obedient majority,” who stood in the way of the adoption of important laws. During the second convocation of the State Duma Galina Starovoitova played an active role in developing these types of laws, such as the laws “On the Employment of the Population of the Russian Federation,” “On the Rehabilitation of the Victims of Political Repression,” “On the Rights of Ethnic Cultural Associations,” “On Alternative Civil Service,” “On Military Obligations and Military Service,” “On Freedom of Conscience and On Religious Associations,” On the Recovery and Protection of the Savings of Citizens of the Russian Federation,” and many others. Deputy Starovoitova’s perseverance led to the adoption of an amendment to the state budget, namely to the section on “External Borrowing,” under which the Russian Joint Stock Company High-Speed Railways was supposed to be allocated a loan of $200 million guaranteed by the Russian government (it later turned out that due to a lack of funds, the only thing the activities of High-Speed Railways succeeded in doing was to create the “world’s most expensive hole” in the Moskovsky Railway Station in St. Petersburg). Galina Starovoitova managed to arrange for $50 million of these $200 million to be used for the restoration of the Kirovsky-Vyborgsky line of the St. Petersburg metro, which had been damaged by erosion. No official announcements were made about what happened to the remaining $150 million of public money. Shortly after the murder of Galina Starovoitova, Deputy of the St. Petersburg Legislative Assembly Aleksei Kovalyov suggested that her death may have been linked with her demand on the then-Governor of St. Petersburg Vladimir Yakovlev to publicly account for the use of a multi-million dollar loan from the World Bank, allocated for the reconstruction of St. Petersburg city centre. Together with Novaya Gazeta, Deputy Starovoitova organised the “Forgotten Regiment“ campaign, and under the same headline in Novaya Gazeta her assistant Mayor Izmailov published information on the search for, and exchange of, prisoners and rescued hostages. Galina Starovoitova was directly involved in getting more than 200 Russian soldiers released from captivity in Chechnya. Her persistence was instrumental in helping to set up an institute for the rehabilitation of veterans of war and military conflicts. She actively supported the initiative of the committee of “Soldiers’ Mothers of St. Petersburg” and succeeded in setting up independent medical examinations for conscripts under the Ministry of Healthcare. In post-Communist Russia attempts were made to justify the need to hold to account the organisers and executors of totalitarian policies. At the heart of the proposals lay the idea of limiting the participation of such people in public and political life, or to bar them from any public or commercial spheres in which they had held power at any level. These proposals, however, failed to garner either popular support or legislative backing. In December 1992 Starovoitova introduced a draft law to the Supreme Soviet of the Russian Federation "On barring those responsible for executing the policies of the totalitarian regime from certain professions." It contained a proposal to impose certain professional constraints on people who had worked for the party apparatus of the Communist Party of the Soviet Union, and on permanent employees and agents of the Soviet and Russian secret services. In 1997 Starovoitova repeatedly tried to submit this bill to the State Duma, but it never made it into law. Long before she was killed, Starovoitova had fears and premonitions: she received anonymous phone calls threatening her and her son, and even took measures for her own protection. On that fateful day on 20 November, her husband Andrei Volkov was perplexed by the fact that Galina had unexpectedly and without explanation changed the time of her flight from Moscow to St. Petersburg. On the evening of 20 November 1998 Starovoitova was murdered in St. Petersburg in the entryway of her apartment building at 91 Griboyedov Canal Embankment, near her flat on the first floor. On that evening she had flown to St. Petersburg from Moscow. At Pulkovo Airport she was met by her aide, 23-year-old Ruslan Linkov, with whom she first went to her parents' before going home to her flat. Starovoitova trusted this aide more than any other: she had been working with Linkov for the past nine years. According to the investigators, waiting for the State Duma deputy at the airport was Sergei Musin, who informed a former warrant officer of the Main Foreign Intelligence Directorate (GRU), Yuri Kolchin, of her arrival. Kolchin, who was also near the airport at the time, then ordered hired killers, members of the Tambov criminal gang, Vitaly Akinshin and Oleg Fedosov, to wait for Starovoitova at her apartment building and kill her. Investigators believe that it was they who shot the State Duma deputy using an Agram 2000 submachine gun and a homemade pistol made from a Beretta Gordon gun. Oleg Fedosov, wearing a woman's wig and dress, is believed to have fired shots at Starovoitova. Linkov, who sustained serious injuries in the volley of gunfire, managed to see the face of one of the assailants and the silhouette of the other: wearing a woman's dress, with straight, shoulder-length hair. Starovoitova sustained two gunshot wounds and died at the scene. Linkov sustained head injuries but survived. He was subsequently the main witness to the crime, though the investigators, for reasons that have never been adequately explained, did not seem overly interested in his testimony ("He was questioned with great caution, and not subjected to the type of persistence and urgency that is usual in such cases."). In the courtroom, several years after the crime took place, Linkov identified the killer, pointing to Akinshin. On 30 June 2005 the city court of St. Petersburg sentenced those responsible for the murder, Yuri Kolchin (as the organiser) and Vitaly Akinshin (as the executor) to 20 and 23.5 years in a strict regime penal colony under one of the most serious articles of the Criminal Code, "Infringement on the life of a public official." A warrant was issued for the arrest of Oleg Fedosov but he disappeared without trace. Investigators were unable to locate his whereabouts. Later, when he was already in the penal colony, Kolchin named the person who had ordered the killing as his friend, the former State Duma deputy from the LDPR Mikhail Glushchenko, who was a member of the Tambov organised crime gang under the name of Misha Khokhol. However, investigators were unable to find any other evidence against Glushchenko and in March 2012 Glushchenko was sentenced to 8 years for a different crime involving extortion. So it has never been established who directly ordered the murder. In August 2007 Linkov released a book entitled Notes from a Survivor, which recounted the circumstances and details surrounding the crime. In summer 2009, after Glushchenko was arrested, Galina Starovoitova’s sister Olga and Ruslan Linkov wrote an open letter to Russian President Dmitry Medvedev, in which they drew his attention to the guarantee of the Constitution that related to unresolved criminal cases and called for the investigation to be continued. On 26 October 2011 the criminal case into the murder of Galina Starovoitova was reopened. Galina Starovoitova is buried in the Nikolsky Cemetery of the Alexander Nevsky Monastery in St. Petersburg. On 17 May 2006, on what would have been Galina Starovoitova’s 60th birthday, a monument to Galina Starovoitova was unveiled in the centre of St. Petersburg on Suvorovsky Prospekt (at the corner of Ulitsa Moiseyenko) in the square named after her. Based on materials from Wikipedia.